Has anyone wondered why the famous shloka on Lord Ganesha starting as “Gajānanam Bhuta Gaṇādi Sevitam” (गजाननं भूतगणादि सेवितं) talks about the food for Ganesha in the very next line before anything else? This food is not even the popular ‘modak’ usually offered to Ganesha. It is “Kapittha Jambu Phalasāra” (कपित्थ जम्बूफलसार) – the core or essence of the fruits of wood apple and jamun. These two fruits are of an odd variety and not exactly sweet. But their trees must have been found in plenty at some time in the past, known from the fact that our country is part of ‘Jambu-dveepa’ – the vast land of jambu trees. An investigation into the origins of the offering of these two fruits to Ganesha gives some surprising but well-thought out ways of our sages in preserving the knowledge of the water sources, yes, you read it right, water sources. Ganesha and water sources have an intimate connection. The present generation can only think of water in the immersion ceremony of Ganesha idols marking the end of the festival. But the old timers would recall Ganesha idols installed near water ways. 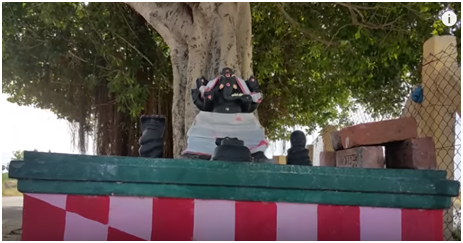 Wherever there was a water body, say, a pond or a tank and however small it may be one could find Ganesha kept under a tree near the water body. 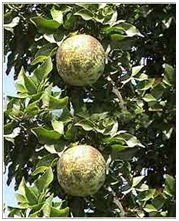 In most locations, it was the peepal tree grown naturally near the water way. This was a common sight in south India where the temple culture didn’t suffer ruination like in North India where foreign invasions had wiped off most temples since thousand years ago. Unfortunately today most water-bodies are made into habitations, but Ganesha temples have survived within buildings. The shloka on the offering of kapittha and jambu fruits is the last reminder of the water-connection with Ganesha worship. The uniqueness of these two fruits is that they grow in places where there is underground water. They are called "Jalanādi" – water-veins. South India is particularly crisscrossed with a net work of underground passages -perhaps formed by the oozing lava at the time of formation of the Deccan Plateau. These passages are filled with rain water during the rainy season. At places where water runs for most part of the year, certain trees are found to grow near them. Approximately 50 such trees identified by our sages were recorded by Varahamihira in his book, Brihad Samhita (chapter 54). Where the water flow is abundant and near the surface, ant hills are formed and trees such as Kapittha and Jumbu grow in specific distance and direction from the Jalanādi and the anthills. 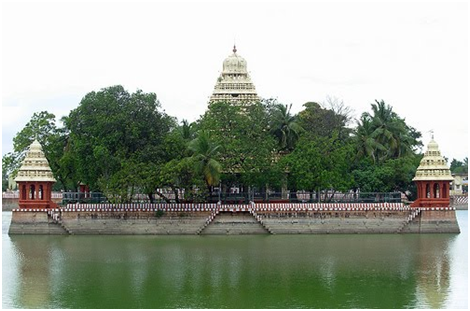 Identification of the Jalanādi by means of trees is not unique to South India alone as the original idea of these trees was given by none other than sage Sārasvata, according to Varahamihira. From a narration found in Mahabharata (Shalya parva - 49) it is known that this sage was born and had lived near the river Sarasvatī. Once there was a drought for twelve consecutive years making all the sages leave the region of river Sarasvatī. But Sārasvata had stayed back and survived through the drought and kept up his Vedic practices. This narration shows that Sarasvatī was a rain-fed river and not sustained by the snow-clad Himalayan Mountain. The drought for 12 years had made the river bed go dry, but sage Sārasvata had managed to draw water from the underground channels of the river by means of the presence of certain trees. Whatever he had discovered was passed on for generations and finally recorded in Brihad samhita in 98 verses. According to Sārasvata, if there is a naturally grown Jambu tree, there will be water at a distance of 4-1/2 feet to the north of it, and the water will be running at a depth of 12 feet. If an ant-hill is found to the east of the Jambu tree, water source is to the south of the ant-hill at 12 feet depth. In the case of Kapittha tree, one must look for a snake hole 10-1/2 feet to the south of it. If there is one, it means water is available in the northern direction of the hole. In this way, underground water sources were identified by means of certain trees. Our ancestors had naturally thought it fit to safeguard these ‘markers’ (trees) by assigning some divine importance to them. Kapittha and Jambu were made the offerings for Lord Ganesha. He was given a home under the Peepal, banyan and neem trees as they are first-rate markers for water sources. Plenty of water can be found near these trees. 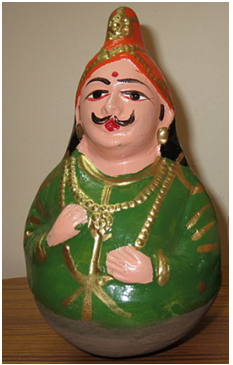 One can find them near the tanks of old temples like the famous Mariamman Teppakulam in Madurai. Though built in the 17th century, it is said that the 7 foot high Mukkuruny Vinayaka, now housed in Meenakshi temple, was found while digging this tank. This reiterates the view that this idol of Ganesha was installed long ago in that region as it was found to hold a water vein. 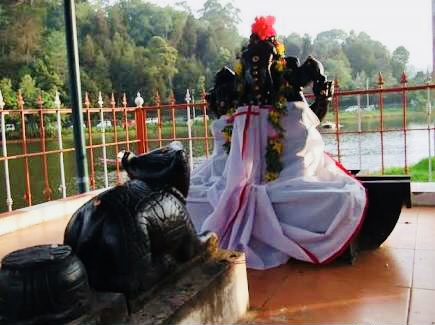 Most of the old temples of Ganesha have legends connected with water. In this backdrop the episode of Arjuna giving water to Bhishma on the arrow bed, by shooting an arrow at the ground looks very much part of the knowledge of Jalanādi. Mahabharata describes that the arrow shot by Arjuna standing on his chariot hit the ground on the south of where Bhishma was lying and from that a jet of water came out. Perhaps he had located the water source from a ‘marker’ tree which acquired his name as ‘Arjuna’ (Terminalia arjuna) after this episode! Sārasvata says that an ant-hill found to the north of Arjuna tree is the indicator for water to the west of the ant-hill at a depth of 21 feet. Perhaps during his circumambulations around Bhishma before shooting his arrow, Arjuna had observed the surrounding areas for the tree and anthill. When will we realise the secret behind these trees? When will we realise that installing deities like Ganesha and Snakes under the trees and near ant-hills has a superior wisdom running through them? The protection of the trees and also the anthill are vital for identifying the Jalanādi. The practice of sprinkling milk in the anthills where snakes reside can perhaps be traced to an ecological reason. In summer the Jalanādis would dry up, thereby making the underground dwelling of the snakes hot enough to drive them out. When people regularly worship the snakes in the anthill by offering milk in the holes, the snake- dwellings would remain cool in summer also. This makes the snakes remain in their dwellings and not venture out posing a threat to the people. This goes to show that our ancestors had evolved methods of worship keeping in mind the psychology of people. Today none of the trees mentioned by Sārasvata are found in abundance and no water ways are identifiable now due to destruction of these trees. At least now we must look around and rebuild Nature as it once existed. Janmashtami from a cosmic angle.